In my continual Shadow Era Shattered Fates travels to find good pairing of unlikely matches, I decided to try and pair Baduruu with the Homunculus Tribe. I was surprised more than anything to find that there is actually some fairly good deck synergy though the tribal synergy is fairly low needing to splash non-homunculus allies to fill the deck. The deck started off as a homunculus deck that I tried to translate as close as possible from my Gravebone Homunculus Deck Trash to Treasure. There really was no available homunculus tribal stuff like Cinderborn Fatebreak, Dagger of Fate or Abomination Factory, so I had to look to creative ways to fill these voids. The Shadow Homunculus tribe runs on low resources so I look to use a limited Resource Control build (Here Be Monsters) which Baduruu generally excels with. Hunters also lack a class discard feature so the discard function of the tribe is represented in a very small percent. 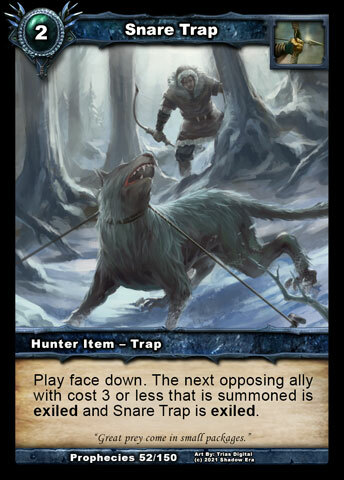 Traps are actually the one of the stronger factors of this deck and all related to a form of control/protection. There are 3 kinds of traps that we use and they all cost 2cc. 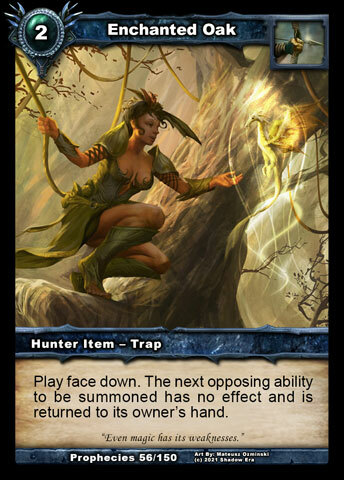 It is important that all of the traps remain the same cost so that opponent is constantly guessing what trap is in play. Snare Trap is the most common trap in resource control hunter build. It helps to control opponents early game plays in a variety of ways. A trap played on turn 2, while Baduruu, is the hero is generally considered a Snare Trap and can dictate how your opponent plays his hand (why we only use other 2cc traps too). The one thing that I do not like about Snare Trap is that it is exiled on it is disarmed. I would much prefer this go to the graveyard to help Gravemonger achieve his summon condition faster but you can not have everything you want. Decoy Trap is another important trap for the tribe. It can essentially act to protect your few allies in a similar way that Cinderborn Fatebreak and Stoneskin attachments do for Mages. Having your allies on the board for an extra turn can really make a difference in the game. Enchanted Oak is the third trap for the deck. This is another preventive type trap with lots of flexibility as to what it effects. In a resource control build its actually really good because your are minimizing opponents resources, then cancelling their ability which can result in net pass turn. Enchanted Oak also helps drain opponents cheap control abilities removing combo play options. Some draw engines and most item destruction cards are abilities. The delay created by Enchanted Oak can be enough tempo loss for opponent to have to change their game plan or just simply take another turn to perform the same option (glimpse into the future). Aside from wanting to establish traps early, we also want to try and play Here Be Monsters early. Generally I like to do this prior to my hero ability becoming available. 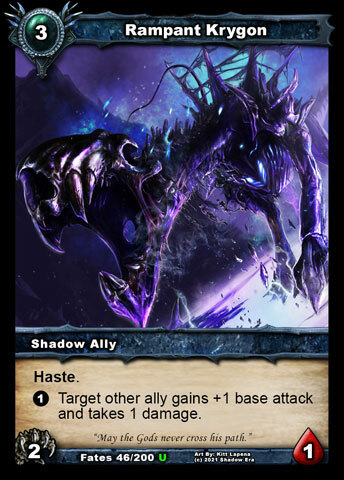 This helps minimize the opponents board threats by cost, and can also help by having them believe you are playing a full resource control build with Cobra Skins. 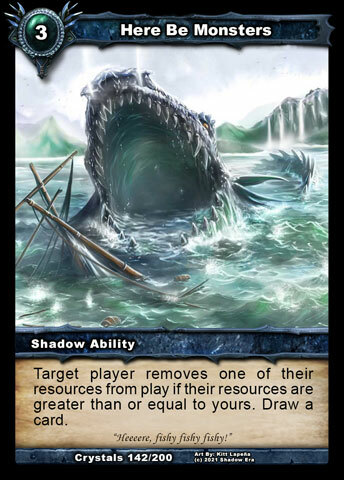 In this instance, playing Here Be Monsters can actually assist in having opponents to begin sacking their higher cost key cards early. The cantrip feature of Here Be Monsters also helps to fill your hand (generally may not sack cards), dig your deck for your key cards and fill your graveyard (importance later). 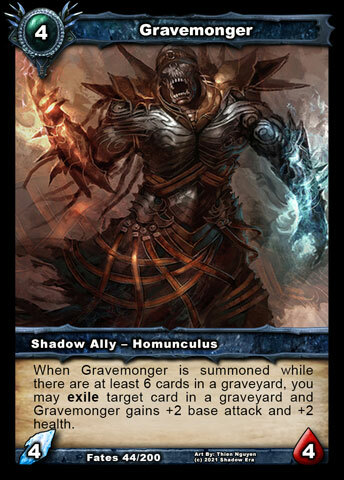 Now the actual reason I choose to use Homunculus are because of the allies Voracious Arachnid and Gravemonger. Early with first use of Baduruu’s Hero ability Voracious Arachnid combos very favorably as his weapons can kill almost all early game allies allowing Voracious Arachnid to start off 2/5. Baduruu’s weapons can generally remain in play so Voracious Arachnid also has the ability to continue to grow to assist with board control, especially since his ability can get around the stealth factor. Later in the game, Gravemonger actually becomes an amazing play for his cost being able to be summoned as 6/6 for 4cc. This is where early HBM stall comes in handy as it helps to fill your graveyard to get to Gravemonger’s summon ability requirement faster. The other allies in the deck are really just fillers. Brimstone Devourer has limited uses because the Hunter Class just does not have the required discard outlets to make him work on a consistent basis. Falseblood Cultist has tremendous tempo value for which fits the deck flavor very well. Its body on the board, discard (potentially Brimstone Devourer) to fill graveyard faster and draw two cards. Rampant Krygon just has overall great synergy in this build. Rampant Krygon helps get opposing allies into kill zone for pairing with weapons, he can buff Voracious Arachnid to increase targetable opponents that can be killed and being able to directly damage opponents hero because of haste. There are several types of draw options for this deck which gives lots of flexibility to how you can play it. 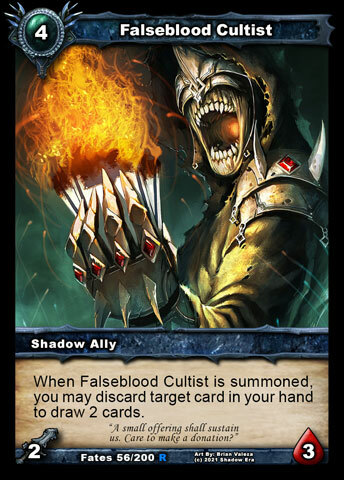 There is Falseblood Cultist which as previously mentioned provides a great tempo boost for the deck. Here Be Monsters was also previously mentioned, providing both cantrip draw and reducing sack opportunities as ways to fill hand. Hunter’s Gambit is the new hunter tool that was introduced with the Shattered Fates expansion. 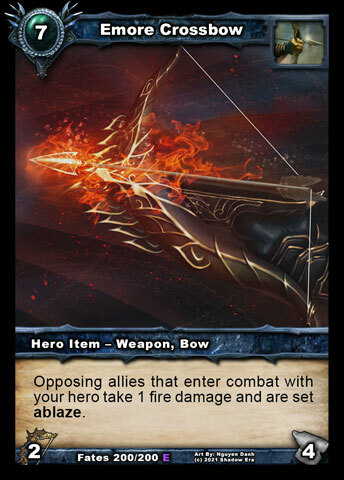 This is a negative attachment that fairs quite favorably with Baduruu’s weapons bringing allies closer to kill range. Grundler’s Double is the last draw option. It may not be uncommon for you to only have 1 ally in play at time. While this is not the bows main use it is still an option. Baduruu’s ability is very dependent on having a weapon in hand to use it on and for this reason we are playing with 7 bows. Here Be Monsters helps early to dig for extra bows in case you do not start or draw any in the first few turns. Both bows, Emore Crossbow and Grundler’s Double provide some flexibility in uses. Emore Crossbow is such a great weapon for this build being able to dish out 4+ damage to most allies. This make Emore Crossbow a very favorable pairing with Voracious Arachnid early to start feeding his attack growth, while keeping opponents resources and options in check with Here Be Monsters. Grundler’s Double creates some more stealth bypass options, but also is a very high durability weapon so it can dish out more damage over time. 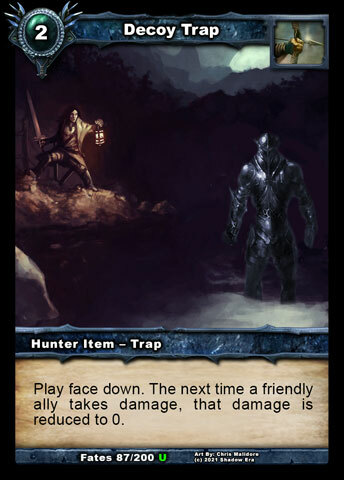 Tagged baduruu, Homunculus, hunter, Resource control, Shadow era, shattered fates, tribal.